ALL SALES REFUNDS WILL BE REFUNDED AFTER ORDER HAS BEEN PROCESSED. #A088 Primitive Stitchery Pattern-Prim Pattern "Country Light !" "Country Light!" AP045 Primitive Stitchery Ball Jar Pattern measures 4 3/4"x 6 1/2". 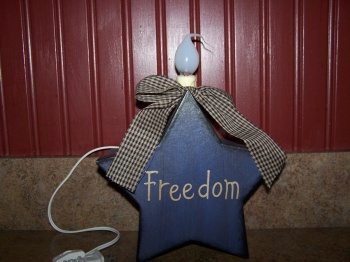 #A229 Primitive "Freedom" Navy Blue Star Box with Candle Light and Navy Blue Check Homespun Bow! Primitive Navy Blue "Freedom" Star Box with Candle Light and Navy Blue Check Homespun Bow. 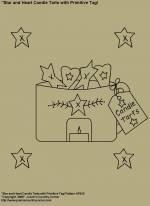 This nice Primitive Star Box with candle is made of hard sturdy cardboard. The electric candle has an on and off switch attached. The measurements are 10" tall, 7 7/8" wide, 3" thick. Please click picture to see larger image of item. 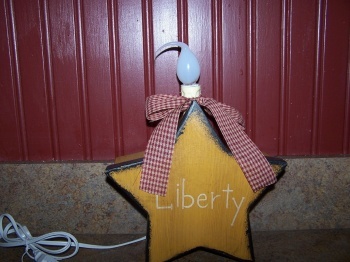 #A230 Primitive "Liberty" Country Red Star Box with Candle Light and Country Red Check Homespun Bow! #A231 Primitive Country Gold "Liberty" Star Box with Candle Light and Country Red Check Homespun Bow! Primitive�Country Gold�"Liberty" Star Box with Candle Light and�Country Red�Check Homespun Bow. 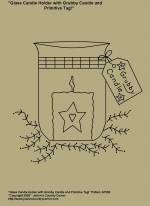 This nice Primitive Star Box with candle is made of hard sturdy cardboard. The electric candle has an on and off switch attached. The measurements are 10" tall, 7 7/8" wide, 3" thick. Please click on picture to see larger image of item. 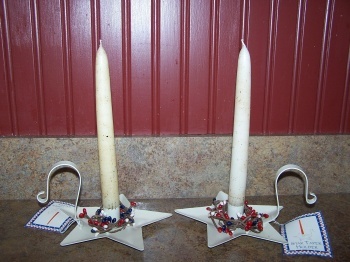 #A232 Pair of Nantucket Home Tan Star Taper Candle Holders and Americana Berry Wreaths! Set of�2 Nantucket Home Americana Tan Star Taper�Candle Holders and Americana Berry Wreaths! The Primitive Star Candle Holders are made of metal. Measurements of the star holders are 3 7/8" tall, 6 1/2" wide. Please click on the picture to see a larger image of the item. 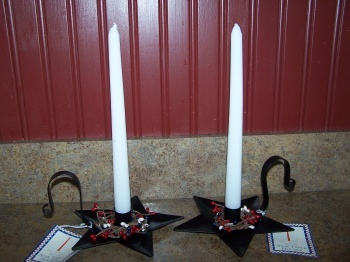 #A233 Pair of Primitive Nantucket Home Black Star Taper Holders and Americana Berry Wreath! 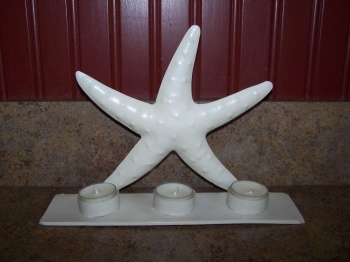 #A235 Rustic Star Fish Candle Holder with 3 Tea Light Candles! Rustic Tan Star Fish Candle Holder with 3 Tea Light Candles. This candle holder can hang�or be placed on a table. It is made of metal and measures 7 1/4" high, 10 1/4" long, 2 1/2" wide.�Please click on picture to see a larger image of item. 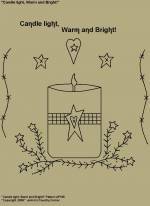 #A283 Primitive Stitchery Pattern, "Candle Light, Warm and Bright!" 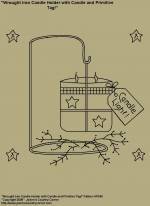 Primitive Stitchery Pattern, "Candle Light, Warm and Bright!" 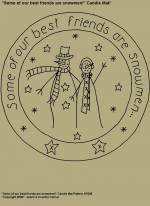 #A296 Primitive Stitchery Pattern, "Some of our best friends are snowmen!" Candle Mat Pattern! 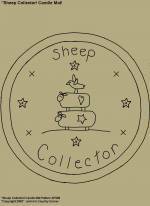 Primitive Stitchery Pattern, "Sheep Collector" Candle Mat Pattern! 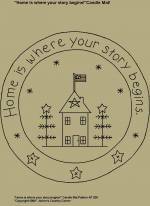 #A294 Primitive Stitchery Pattern, "Home is where your story begins!" Candle Mat Pattern! Primitive Stitchery Pattern, "Home is where your story begins!" 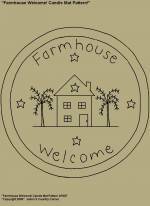 #A295 Primitive Stitchery Pattern, "Farmhouse Welcome!" Candle Mat Pattern! 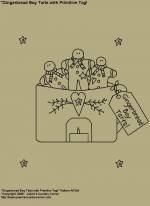 #A297 Primitive Stitchery Pattern, "Heartfelt Handmade Snowman!" Candle Mat Pattern! 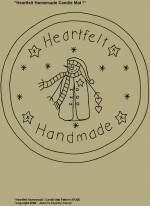 Primitive Stitchery Pattern, "Heartfelt Handmade!" Snowman Candle Mat Pattern! Primitive Stitchery Pattern, "Candle Tart Burner and Gingerbread Boy Tarts with Primitive Tag!" Measures 4 7/8"x5 7/8". 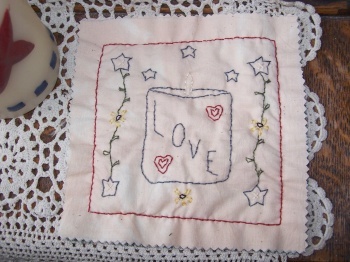 Primitive Stitchery Pattern, "Star and Heart Candle Tart Holder with Star and Heart Tarts and Primitive Tag, "Candle Tarts". Measures 5 7/8"x 7 3/8". 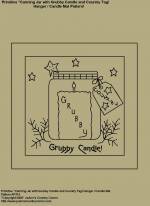 Primitive Stitchery Pattern, "Glass Candle Holder with Grubby Candle and Primitive Tag, "Grubby Candle!" Measures 6 1/4" x 6 3/4". 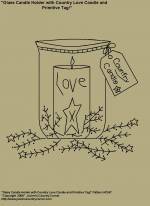 Primitive Stitchery Pattern, "Glass Candle Holder with Country Love Candle and Primitive Tag "Country Candle". Measures 6 1/4" x 6 1/4". 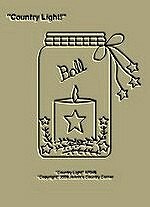 Primitive Stitchery Pattern, "Wrought Iron Candle Holder with Candle and Primitive Tag, " Candle Light!". Measures 6 3/4" x 7 1/4". 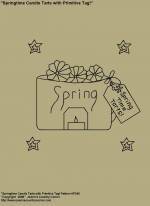 Primitive Stitchery Pattern, "Springtime Candle Tarts with Primitive Tag,"Spring Time Tarts!" Measures 5 3/4" x 6". 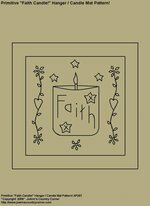 #A380 Primitive Stitchery Pattern, "Faith Candle!" Hanger / Candle Mat Pattern! 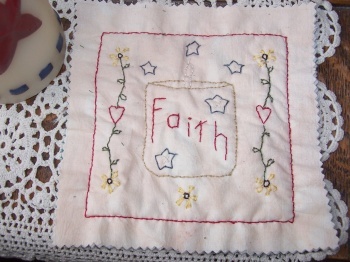 Please click on pattern to see a picture of the finished stitched Candle Mat, stitched by Jo-Ann Fortin. Finished Mat can hang with Homespun Material. Measures 6 1/2" x 6 1/2". #A381 Primitive Stitchery Pattern, "Love Candle!" Hanger / Candle Mat Pattern! 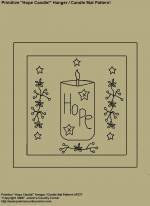 #A385 Primitive Stitchery Pattern, "Hope Candle with Sunflowers! Finished mat can also hang with homespun material. Measures 6 1/2" x 6 1/2".